Printing or recording calculators cover an enormous range, from basic hand-cranked office adding machines, through electric machines with semi-automatic multiplication, to fully-automatic four-function calculators and specialised bookkeeping and accounting machines. 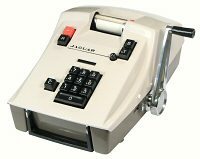 The distinguishing feature is the printing mechanism, which records keyboard entries and calculation results on a paper tape or a pre-printed form. 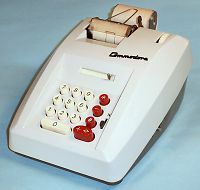 Printing calculators are generally associated with business and commercial applications, although some machines (such as the Olivetti Divisumma 24) provided serious competition for the full-function rotary calculators. J.A.V.Turck devotes considerable time to establishing the precedence of the Felt & Tarrant "Comptograph" of 1889 as the first practical recording calculator. 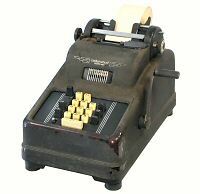 The Comptograph combined a printing mechanism with the key-driven Comptometer adding machine, but it was not a commercial success. Although the Comptograph was eventually discontinued, many of Felt's inventions relating to the printing and paper-handling mechanisms lived on under licence to other manufacturers. The Burroughs high-keyboard adding machine of 1892 had much greater success in the marketplace, and spawned a host of competitors. The early Burroughs machine performed addition only, with no provision for subtraction or the use of complements. It had a visible numerical register to display the accumulated total, but the printing mechanism was out of sight at the rear of the machine. (The machines were sold primarily to banks, where the paper tape was intended as a permanent record for the auditor, not for the operator). The Burroughs machine used a reciprocating (rather than a rotary) mechanism, and required the operator to make a "blank stroke" to clear pending carries before printing a total or sub-total. A great many enhancements for the Burroughs-style machine were developed during the early years of the 20th century. The printing mechanism was soon relocated to the top of the machine to produce the "visible adder". 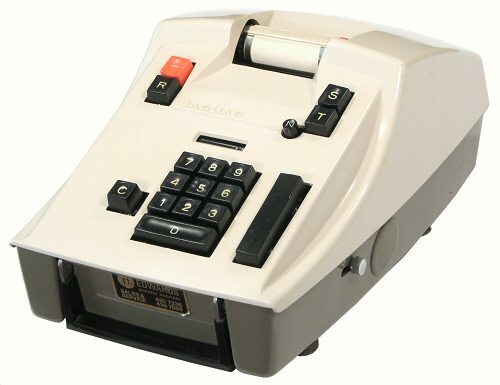 The ten-key numeric keypad was introduced as an alternative to the full keyboard, and then expanded to 12 keys for Sterling currency or 15 keys for Sterling with farthings (quarter-pence). 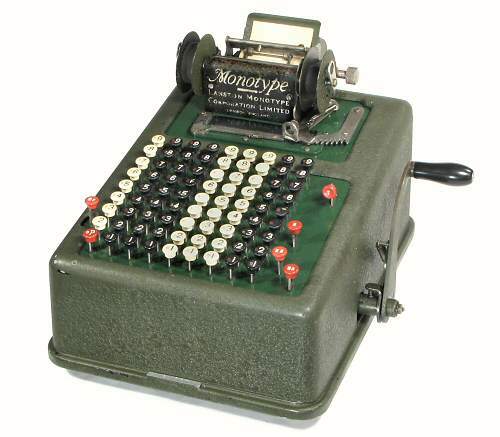 Many of the Sterling machines also had a "Whole Numbers" (WN) mode for decimal calculations. Machines were produced with direct subtraction, and later with the ability to print true negative totals rather than complements. (The negative total or "credit balance" is actually a difficult problem, involving circular carries and the injection of a "fugitive one" as the register passes through zero). Smaller and lighter machines were marketed to shopkeepers rather than banks and accounting offices, and eventually to individuals. Other early developments included the printing of symbols to show the operations performed, a "non-add" function to allow reference or batch numbers to be printed on the tape but not included in the total, a two-colour ribbon to print totals (or sometimes negative balances) in red, and a "Repeat" key to allow multiplication by repeated addition. Much effort was spent on "blank stroke elimination", which often required the re-design of the adding mechanisms so as to complete the tens-carries during the current cycle. Many of these features remained as optional extras - even during the 1950s it was still possible to find low-cost add-only machines, or machines which still required a blank stroke before taking a total. The mechanism and principles of operation of a typical office printing calculator are explained further in the description of the Adwel W504 in the Technical Section. The principles of operation, in particular, are common to most office adding and listing machines, and may be used as a general guide to the workings of machines of similar construction. 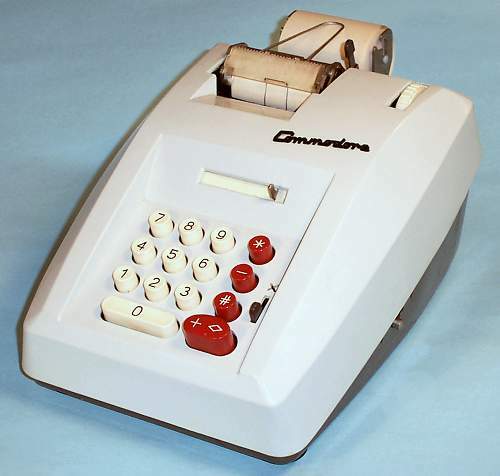 The preponderance of late-model printing calculators found in Australia is a direct result of the conversion from Sterling to decimal currency in 1966. Most of the pre-decimal printing calculators were full-keyboard machines from the likes of Burroughs, Victor, and Monroe, with a smaller number of ten-key Sterling machines from Underwood, Odhner, and others. Many of these machines had been in constant use since the 1920s or 30s. During the change-over period the more modern machines were converted to decimal operation, while older machines were generally scrapped and replaced outright. The Government funded the conversion or replacement of about 250,000 "monetary machines", with an unknown number of older machines replaced directly by their owners. 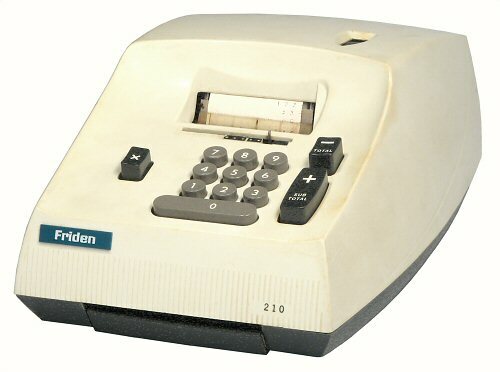 A huge number of mid-1960s printing calculators were imported from any available sources to provide the replacements. These new machines were themselves replaced by electronic printing calculators in the early 1970s, after a working life of less than ten years. This site shows only a small selection from a very wide range of printing calculators, generally arranged by manufacturer and in chronological order. Click on the photos for larger illustrations. Machines produced (or purchased and distributed) by the major calculating machine companies are listed on the manufacturers pages, which are also accessible from the links below. Machines from smaller manufacturers, or those for whom I have not yet produced an individual page, are listed in the sections following. If you are looking for a specific machine it may be quicker to use the Full Index, which includes all of the machines on this site. Glenn J Barrett (b.1869) had an interest in both typewriters and adding machines. Several of his patents from the early 1900s relate to adding mechanisms for typewriters, and are variously assigned to the Burroughs, Smith, and Remington companies. In 1910 he designed a new non-printing calculator, and set up the Barrett Adding Machine Company in 1914. The company produced a range of printing and non-printing machines in full-keyboard and later in ten-key versions. In 1922 Barrett sold the business to the Lanston Monotype Company, who continued to develop and manufacture the machines into the 1940s. The machine illustrated has 9 decimal columns in the keyboard. The mechanism performs addition only, but the keytops are marked with complements for use in subtraction. There are three function keys for Non-add, Repeat, and Keyboard Release at the front right-hand side, and a Non-Print key on the left. The Total key is positioned at the top right of the keyboard, and is arranged to be pushed rearwards with the thumb as the operator reaches for the handle. There is no Sub-total key, but sub-totals can be printed by commencing a Total cycle and then pressing the Keyboard Release key. 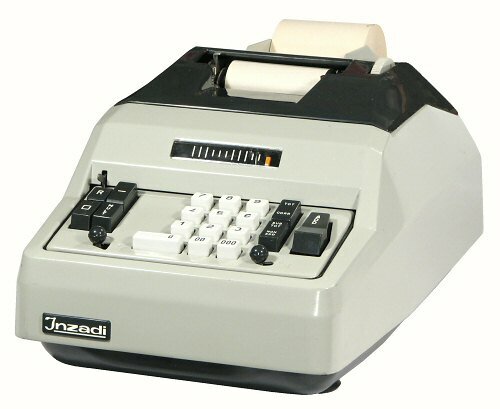 The accumulator and printing mechanisms have 3 columns to the left of the keyboard rather than the usual 1. A notched lever above the keyboard allows the accumulator register to be moved up to 7 places to the right to provide the decade shift for multiplication. The accumulator register is directly visible through the window above the keyboard, and has a movable decimal point indicator. The printing mechanism has the exposed ribbon spools mounted vertically on either side. A drive shaft through the centre of the spools is pushed manually to the left or right to reverse the ribbon. The Barrett mechanism is described in detail in US Patent 1326564 (52 pages), filed in 1915 and assigned to the Barrett Adding Machine Company. The machines are well designed and solidly built, with a cast aluminium base and cover. The machine illustrated appears to have been re-painted in green over the original black, and is still in good working order. Manual, 9/12 columns, Sterling (with farthings). The "Barrett Desk Machine" Model 152 is a later 9-column add-only machine for Sterling currency, with farthings. The machine retains the 12-column accumulator and printing mechanisms of the model above, but does not have the multiplier control. The Non-print key has been replaced by a small lever. A Sub-total key has been added next to the Total, and the ribbon spools are now horizontal and enclosed. 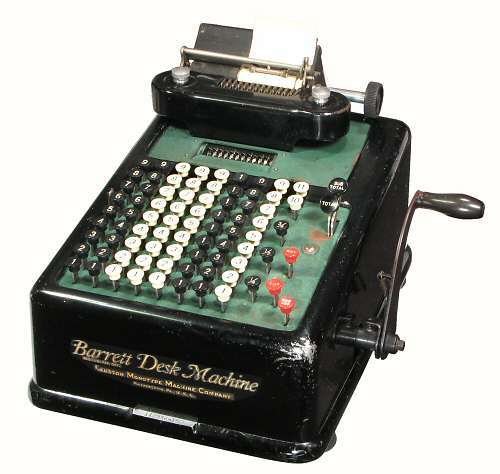 After selling his Barrett Adding Machine business (above) to Monotype in 1922, Glenn Barrett designed a smaller and lighter adding machine to be known as the "Portable". The mechanism is described in his US Patent 1811840 (42 pages), filed in 1925. 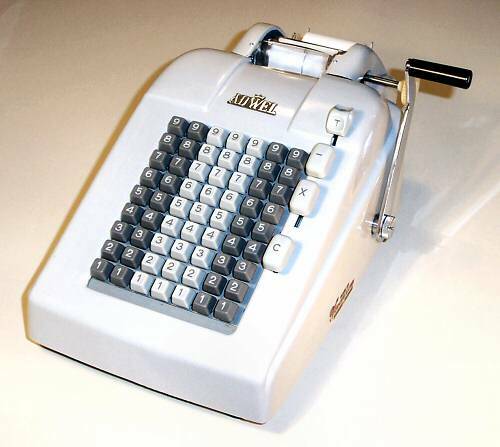 The machine was manufactured by the Corona portable typewriter company and sold through Barrett's new Portable Adding Machine Company. Corona merged with L.C.Smith typewriters in 1926 to form L.C.Smith & Corona, which purchased Barrett's interests on his retirement in 1934. Barrett continued to work on the machine, and was still filing patents into his 70s. L.C.Smith & Corona became Smith-Corona Inc in 1946, then absorbed Marchant in 1958 to become Smith Corona Marchant and later the SCM Corporation. 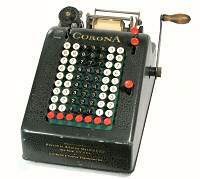 The Corona/Portable illustrated is a manually-operated 7-column machine for decimal currency. It was probably built in the early 1930s. The machine has a Non-add key, but there is no provision for subtraction or repeated addition. The printing mechanism moves the platen roller forward to take an impression from the fixed type carriers, then back about 30mm so that the impression is clearly visible. Both the ribbon spools are on the left-hand side. Manual, 8/9 columns, Sterling with farthings. Manufactured: Aktiebolaget Addo, Malmo, Sweden, 1926-1936 approx. The Addo company of Malmo in Sweden produced a range of slide-set adding machines from about 1920. These were replaced by a range of full-keyboard adding and listing machines (Models 6 to 10) in 1927. The full-keyboard machines were largely superseded by the ten-key "Addo X" from 1936. Pin-wheel machines were made and sold under the "Addo Multo" brand from 1949. Addo was absorbed into the Advidaberg/Facit/Odhner group in 1966. This Addo Model 9-K is a full-keyboard machine for Sterling currency, with farthings. It has a heavy black Bakelite casing, and sits on a solid rubber mat about 20mm thick. The machine is relatively narrow, with the function keys at the top of the keyboard rather than at the side. (The central key with the "missing" keytop is a latch for the adjacent subtraction key). The machine has direct subtraction and true negative balance, but still requires a blank stroke before taking a total if carries are pending. Adwel founder J�rgen S Lien (b.1909) was involved with the office machine industry from 1931. 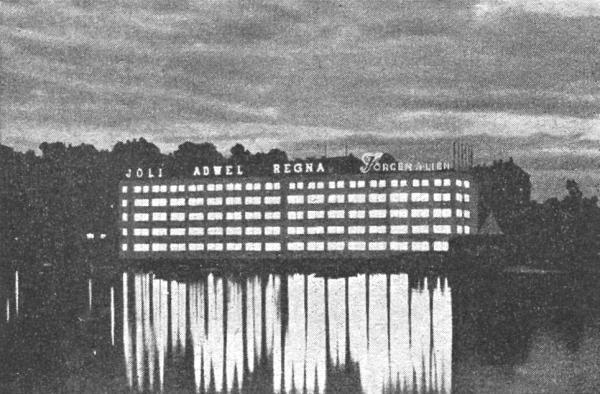 By the late 1950s his factory in Bergen (Norway) was exporting Regna cash registers and Adwel adding machines to 75 countries. The firm did not survive the transition to electronics and closed in the 1970s. This Adwel W504 is a basic full-keyboard office adding machine for decimal currency. The hand cranked mechanism also performs direct subtraction, but with negative totals shown as complements. There is no "non-add" function. The machine contains a mechanism to suppress leading zeros in the printout, but requires the operator to make a "blank stroke" before taking a total or sub-total. Although it is a relatively simple machine, its internal mechanism contains well over one thousand manufactured parts. The mechanism and principles of operation of the Adwel W504 are described in more detail in the Technical section. The principles of operation, in particular, are common to most office adding and listing machines, and may be used as a general guide to the workings of machines of similar construction. 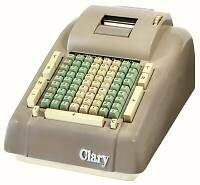 The Clary Corporation built a range of calculating, multiplying, and accounting machines from the early 1940s. The family-owned company still exists, but is no longer in the calculator business. This Model 189 is an electrically-operated decimal machine with direct subtraction, Non-add, and Repeat functions. Several of the function keys are duplicated to simplify operation with either hand. The machine illustrated was originally used in the office of T.G.Cobbledick & Co, who operated a long-established motor garage and dealership in Traralgon in country Victoria. The Sundstrand family were Swedish immigrants who established a machine tool business in Rockford Illinois in the 1880s. 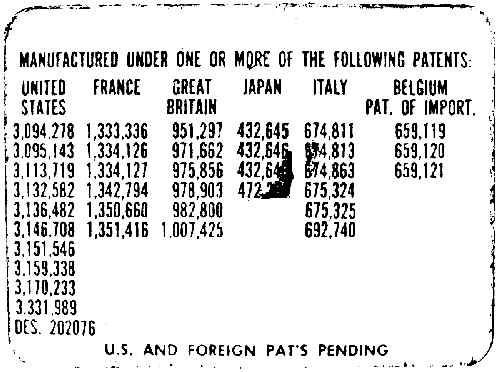 In 1912 G.David Sundstrand filed a US Patent (No. 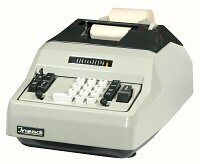 1329028) for a printing calculator with a ten-key two-row keyboard. In 1914 he filed a much improved design (No. 1198487) which formed the basis for an extensive range of machines that continued well into the 1950s. The Sundstrand 1914 machine is thought to be the first to use the now-familiar ten-key calculator keypad with the numbers arranged in ascending order from zero. David's brother Oscar (b. 1889) continued the development of the Sundstrand machines during the 1920s, and remained as chief designer when the calculator business was sold to Underwood in 1927. Oscar Sundstrand retired at age 60 in 1949, but was quickly hired as a consultant by the Victor Adding Machine Company. 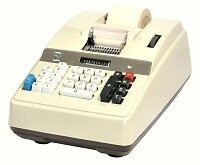 By 1955 he had produced a new fully-automatic printing calculator which formed the basis of Victor's full-function "Premier" series. He was still filing patents for Victor in 1967. 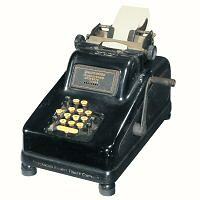 The Underwood-Sundstrand Model 8112 is an addition-only machine for Sterling currency, without farthings. The machine illustrated was built in the late 1930s. It is based on David Sundstrand's 1914 machine, with Sterling-currency modifications from Oscar's 1928 patent (No. 1885489). The machine has Non-add, Repeat, and Correction keys, and a lockable "Whole Numbers" key for decimal calculations. The printing mechanism has a two-colour ribbon to print totals in red. The machine is fitted with a simple fixed carriage which accommodates paper up to 100mm wide, although the printing width is only 45mm. Larger travelling carriages were available as options, and could be exchanged by the user by removing two screws. The calculator mechanism is very solidly constructed on a cast-iron bedplate, and is still in good working order. Manufactured: Underwood Corporation, USA, 1947. Underwood Elliott Fisher became the Underwood Corporation in 1945, and was absorbed into Olivetti in 1959. This Underwood-Sundstrand Model 10150 from 1947 provides addition and direct subtraction in Sterling currency (without farthings). The mechanism is generally similar to the machine above, but with a cast aluminium bedplate and a more streamlined Bakelite cover. The Bakelite keyplate and the painted cover are ornamented with "three-stripe" motifs in the Art-Deco style. Thomas O Mehan was a chemical engineer from Chicago who designed a small, light-weight adding machine in the mid-1920s (US patent 1899444, filed in December 1925). The machine was named the "Brennan", after businessman Thomas Brennan who financed the manufacturing operation. 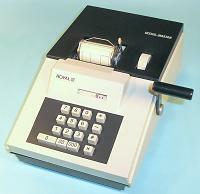 The Brennan was an 8-column ten-key machine with a visible register and subtraction by complements. The machine went on sale in 1929, just in time to become an early victim of the depression. The manufacturing rights were sold to Remington, who re-named the machine as the "Monarch" and put it into production at their plant in Norwood, Ohio. Mehan filed a couple more patents for the machine in 1933 and 1935 (giving his address as Norwood), but appears to have relinquished the Monarch development to Walter Landsiedel of Remington in 1936. Mehan returned to Chicago, and in 1938 was appointed head of research and development at the Victor Adding Machine Company. Landsiedel made major improvements to the Monarch with a string of patents from 1936 to 1939. The visible register was replaced with a new "tumbler" accumulator to provide direct subtraction. The box-like case was raised and lengthened to accommodate an internal electric motor drive, with a powered clearing function replacing the front-mounted clearing lever. A separate column indicator was fitted at the top of the keyboard. True negative totals and printed indicators were developed, along with semi-automatic multiplication and division controls. 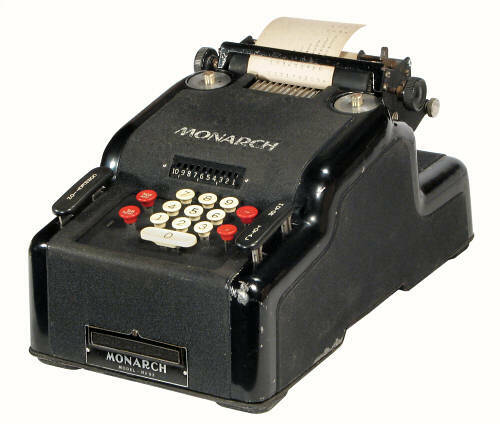 The basic non-printing Monarch was updated in 1939, and an improved multiplier was added in 1948. This Monarch Model 93 from the late 1930s is a 10-column machine with an electric motor drive. The machine performs direct subtraction, but shows complements rather than true negative totals. The Motor bar on the right of the keyboard performs a single addition cycle, while the "X" key performs repeated cycles for multiplication. Subtract and X can be pressed together to perform repeated subtractions. The machine operates at about 120 cycles per minute, or 2 cycles per second. The machine has a Non-add key and a Sub-total key, but there is no separate Total key - the operator simply presses the motor bar twice to take a total (once as a blank stroke to clear the carries, and again for the total cycle). The Correction bar on the left-hand side cycles the machine to clear the keyboard. The nameplate on the front of the machine still has the cut-out slot for the earlier manual clearing handle, but it is filled with a blanking plate. The printing mechanism uses rising type carriers with individual spring-loaded type bars, and is largely unchanged from Mehan's original design. The internal view shows the basically rectangular mechanism (as inherited from the Brennan) raised to an angle of about 20° on a substantial cast-aluminium base, allowing the motor drive and switchgear to be mounted in the extended rear section under the paper roll. The Maruzen Sewing Machine Company was a late entrant to the adding machine market with this "Jaguar" portable calculator. The machine has a heavy plastic cover which clips over the entire upper section to provide protection in transit. The cover also provides storage for the operating handle and the instruction booklet. There is a carrying handle at the front, and moulded feet at the rear so that the unit may be stood vertically. The paper roll is fully enclosed within the casing. The mechanism of this machine is described in US Patent 3321133, filed by Makoto Okuda in 1965. An electric version of the Maruzen Jaguar machine, powered by a small AC induction motor. This AM-601 adding machine from the Tokyo Electric Company (TEC) uses a second numeric keypad to provide semi-automatic multiplication. The first factor is entered on the main keypad and the "X" button pressed in the normal manner. The digits of the second factor are then entered one at a time on the auxilliary keypad at the left, starting with the least significant. As each digit is entered the machine performs the required number of additions and moves automatically to the next place. When all digits have been processed the operator clears the keyboard and takes a total to show the final result. Guiseppi Inzadi built a range of ten-key printing calulators in Milan from the late 1930s. 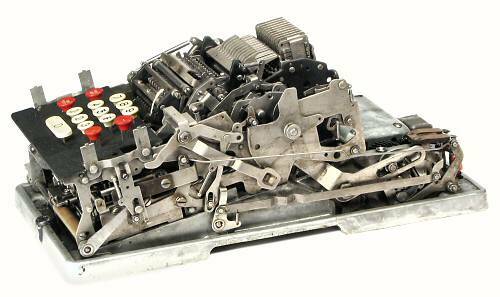 This 1960s Model M5 is a substantial machine with fully-automatic multiplication. 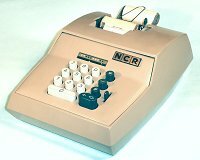 The American rotary calculator companies (Monroe, Marchant, and Friden) all developed ten-key calculators during the early 1960s. These were high-end machines with automatic multiplication, division, and decimal alignment, but they were superseded by the new electronic machines before they ever became fully established in the market. The companies were sold, merged, and restructured as their sales evaporated during the 1960s. Re-badging and re-selling of low-end machines maintained a brand presence for a period, until the companies finally went out of business in the early 1970s. The Friden Calculating Machine Company was taken over by the Singer (sewing machine) Company in the early 1960s. This stylish machine from the late 60s was clearly designed as a portable calculator for the travelling accountant. There is a matching clip-on cover for the keyboard, a pull-out carrying handle at the front, and moulded-in feet on the back so that the machine can be stood vertically while in transit. The top cover is easily removed to replace the fully-enclosed paper roll. The patent label on the underside of this machine gives an indication of the confusion in the US calculator business in the late 1960s. The list of US patents reveals that this "Friden 210" from the "Friden Division of Singer" is actually a Clary "Addmaster" - in a case designed by Marchant! The family-owned Clary Corporation built a range of calculating, multiplying, and accounting machines from the early 1940s. 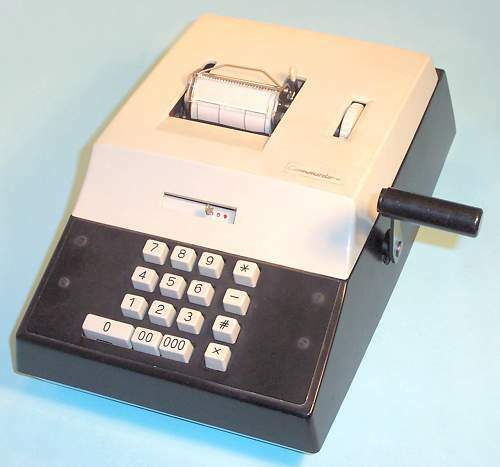 The Addmaster Corporation was formed in 1961 to manufacture their new line of low-cost ten-key machines. The Addmaster was an innovative design which made extensive use of plastic components to reduce the weight, noise, and power requirements. Both Clary and Addmaster still exist, but are no longer in the calculator business. The US design patent 202076 for the calculator casing with the removable keyboard cover was filed in 1964 and assigned to the SCM Corporation (the successors to Smith-Corona Marchant). Addmaster mechanisms in similar casings were also sold with the Addmaster and Marchant brands. The Monroe Calculating Machine Company was acquired by Litton Industries in 1958 and became a part of the Litton "Business Systems" group. 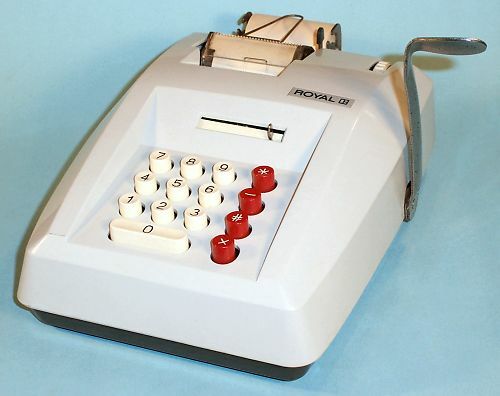 By the late 1960s the Monroe name was being applied to a range of products that had little or no connection with the original calculator company from Orange, New Jersey. 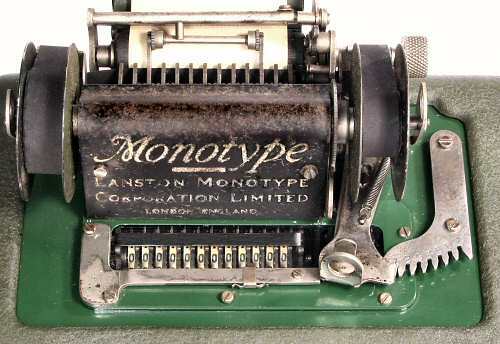 This ten-key add-list machine is branded "Monroe", but was built in the UK by some other (unidentified) part of the multi-national Litton group. It seems that by the late 1960s, low-cost 10-key mechanisms were available as components to be incorporated to order into other manufacturers' products. The following group of machines carry a variety of brand names, but they are all built around the same compact adding and printing mechanism. The machines all have similar serial numbers, and differ only in their external casings and driving arrangements. There are no model numbers, and no definite indication of who actually built the mechanisms or the casings. This machine carries a "Royal" nameplate with a Litton Industries logo. Litton started as a small electronics company in the 1950s, and eventually became a major supplier of military equipment. Along the way they acquired the famous "Royal" typewriter brand, which was used for a time on some mechanical and electronic calculators. 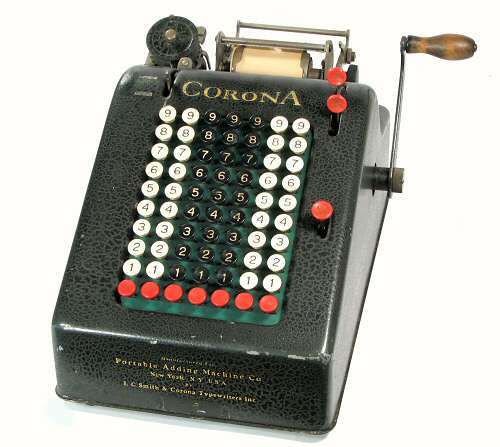 The all-metal mechanism of this calculator is quite compact and well-designed, although the plastic casing is rather light and generously proportioned. The mechanism is raised at the rear to bring the keyboard to a 20° angle, and there is about 100mm of empty space at the rear to hold the paper roll. 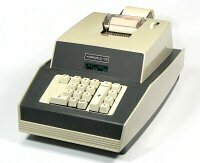 A 10-key manual adding machine sold by Commodore Business Machines, who later achieved fame in computers with the Commodore PET, VIC-20, and Commodore 64. The internal mechanism of this calculator is identical to the "Royal" above. The illustrated instruction booklet is printed in German, English, and French, and carries a Litton Industries logo and the address of a printer in Berlin. Manufactured: "Willy Feiler Berlin 10 Typ 9/9"
An electrically-operated 10-key machine with a "Commodore" brand. The mechanism is basically the same as in the manual models, with the operating handle replaced by an "Add" button on the keyboard and a small capacitor-run motor in the empty space under the raised baseplate. The "X" (Multiply) key has been reduced to a small lever, and there is only a single zero key. The case has been shortened by 75mmm, with the paper roll mounted externally. The mechanism is mounted in a deep pressed-metal base with a moulded plastic cover. The machine is labelled "Willy Feiler Berlin 10 Typ 9/9" on the rear of the base. It is not known whether Willy Feiler manufactured the mechanisms, or the cases, or just assembled them for Commodore, or Litton, or others. A compact 10-key manual machine with a Litton "Royal" brand. The internal mechanism of this calculator is identical to that of the manual models above, while the plastic cover is identical (apart from the cut-outs) to that of the Commodore electric model. The mechanism is mounted flat instead of sloping in a shallow metal base, reducing the height by 35mm and giving a much more compact appearance. This "NCR" machine uses the same basic mechanism, but with 11 digits instead of 9. Some of the ancilliaries have been re-arranged to fit the machine into the smallest possible casing. The mechanism is mounted flat instead of sloping, as in the Royal manual model above. Both ribbon spools are mounted on the left-hand side, making room for a small induction motor beside the printer mechanism on the right. The pinbox position indicator is mounted behind a window and can no longer be used as a clearing lever, so a powered "Clear" function has been added to the "X" lever. The end result is a compact and functional machine in a case which looks suspiciously similar to the new electronic calculators. It was clearly "the end of the line" for the mechanical office adding machine. J.A.V.Turck's "Origin of modern calculating machines" (1921) provides a detailed review of the early development of the printing calculator.